Some caregivers need help when the person is in the early stages of Alzheimer's disease. 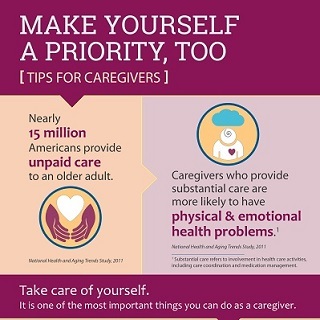 Other caregivers look for help when the person is in the later stages of Alzheimer's. It's okay to seek help whenever you need it. As the person moves through the stages of Alzheimer's, he or she will need more care. One reason is that medicines used to treat Alzheimer's disease can only control symptoms; they cannot cure the disease. Symptoms, such as memory loss and confusion, will get worse over time. The Alzheimer's Association offers information, a help line, and support services to people with Alzheimer's and their caregivers. Local chapters across the country offer support groups, including many that help with early-stage Alzheimer's disease. Call or go online to find out where to get help in your area. The Association also funds Alzheimer's research. The Alzheimer's Foundation of America provides information about how to care for people with Alzheimer's, as well as a list of services for people with the disease. It also offers information for caregivers and their families through member organizations. Services include a toll-free hotline, publications, and other educational materials. Here is a list of services that can help you care for the person with Alzheimer's at home. Find out if these services are offered in your area. Also, contact Medicare to see if they cover the cost of any of these services. See below for Medicare contact information. Home health care services send a home health aide to your home to help you care for a person with Alzheimer's. These aides provide care and/or company for the person. They may come for a few hours or stay for 24 hours. Some home health aides are better trained and supervised than others. The person with Alzheimer's must qualify for the service based on local guidelines. The Eldercare Locator can help at 1-800-677-1116 or https://eldercare.acl.gov. Or, contact Meals on Wheels America at 1-888-998-6325 or www.mealsonwheelsamerica.org. Adult day care services provide a safe environment, activities, and staff who pay attention to the needs of the person with Alzheimer's in an adult day care facility. They also provide transportation. The facility may pick up the person with Alzheimer's, take him or her to day care, and then return the person home. Adult day care services provide a much-needed break for you. Call the National Adult Day Services Association at 1-877-745-1440, or visit www.nadsa.org/consumers/choosing-a-center. You can contact the Eldercare Locator at 1-800-677-1116 or at https://eldercare.acl.gov. Respite services provide short-term care for the person with Alzheimer's at home, in a healthcare facility, or at an adult day center. The care may last for as short as a few hours or as long as several weeks. These services allow you to get a break to rest or go on a vacation.